Home > Wacom > Gadget review: Wacom Intuos 3D; make your own Miku figures (or anyone else)! Gadget review: Wacom Intuos 3D; make your own Miku figures (or anyone else)! Gadget review by Matt S.
Most anime fans - or fans of Japanese games - have at least a few figures lying around. It might be that they got them from limited edition sets of their favourite games. Or they might actively go out and buy the things, as I have with my Hatsune Miku collection (now over 40 strong and one very weeping wallet). What I didn’t realise is that it is actually really (really) easy to make your own figures. Well, easy for people who enjoy the creative process of designing and then “drawing” figures, anyway. All you need is a spot of artistic talent - which I sadly don’t have - and a surprisingly inexpensive hardware and software package from Wacom. Wacom’s Intuos 3D package comes with a creative pen and touch tablet, as well as a bit of software called ZBrushCore. Those two pieces of technology together give you everything you’ll need to create a fully rendered, detailed 3D model; one that looks every bit as good on the shelf as any commercial figure that you might buy. You can then send that 3D model off to a 3D printing house to print off for you (in Australia, both Officeworks and Shapeways offer 3D model printing). Then, when you’ve got the 3D printed model back, all you need to do is paint it, and bam! You’ve created your very own 3D figure. As I said at the start, I’ve got no talent for this kind of thing myself. However, Wacom was kind enough to invite a talented artist, Lyle Dalgleish (https://vimeo.com/user39161267), to use the system to build a full 3D model of DigitallyDownloaded.net’s mascot, Dee Dee, which we have printed off (you can see her below). Dancer from Lyle Dalgleish on Vimeo. As you can see, the process is as involved as you would expect for any art work, but with a halfway reasonable computer and the Intuos package, there’s nothing that you wouldn’t be able to do, given the time, training, and skill, that the best sculptors that work on Hatsune Miku figures work on. In face, making your own Hatsune Miku figures sounds like a really good reason to buy this setup. Is there a Miku costume/module that you really like, but hasn’t been turned into a figure? Do it yourself! Is there a pose from a game or artwork that you’d like to see in 3D? Have at it. A little like how the Hatsune Miku’s voice software is only a couple of hundred dollars, and allows you to participate in the culture of making music using her voice, the Intuos 3D allows you to engage in anime and manga fan cultures by actively creating 3D “assets,” artworks, and even figures. And we’re not just talking about Miku, of course. Perhaps you’re a fan of a video game character that doesn’t have enough figures of him/her - you can remedy that for the sake of your own collection. And if you’re an indie game developer, then here’s a chance to produce some merchandise for yourself and help get people into your games. So many indie games out there would benefit from having collectibles, I feel, and for game developers and all their artistic skill, this should be a very easy process indeed. Indie developers could even provide the raw 3D file to their fans so they can print the figures off for themselves, saving on production costs, but having that same effect of using merchandise to really engage with the community. For anyone who hasn’t used Wacom technology before, it must be said that the Intuos 3D is an absolute delight to use, and gives people like me, with limited artistic skill, the best chance that we’re ever going to have of pulling something decent out of our brains and sticking it on the digital canvas. The pen that comes with the tablet feels incredible, offers plenty of pressure sensitivity, and glides across the tablet with ease. I’m not going to go into tech specs - that’s really not my thing, but I found the thing to be a perfectly adequate simulation of the experience of using real art equipment, with the added benefit of “undo” shortcut buttons for when you make mistakes (and I made plenty of them). The Intuos 3D is for much more than creating figures, though. It’s quite easy for aspiring board game designers to prototype their designs, and print them off, for example. Kickstarter remains a really lucrative platform for board game designers, and general wisdom is that if you want your Kickstarter to succeed, then you really do need to invest in a prototype of the game in action. You’ll be able to build all the assets for that yourself using this device, potentially saving you a great deal in production costs for the development of that prototype. And to compare to the original Dee Dee design, click on over here. The base software can also be used to create the basic skeleton of 3D models for game production, which you can the import into animation software and continue to work on it from there. Again, what’s so exciting about this all is that the up-front costs are cheap, and the quality that can be produced through the software is of an exceedingly high standard. Young game developers can really benefit from creating their character models in this, and indeed Lyle Dalgleish teaches at one of the local colleges dedicated to game development, and gets his students using the same base hardware and software that comes in the package. 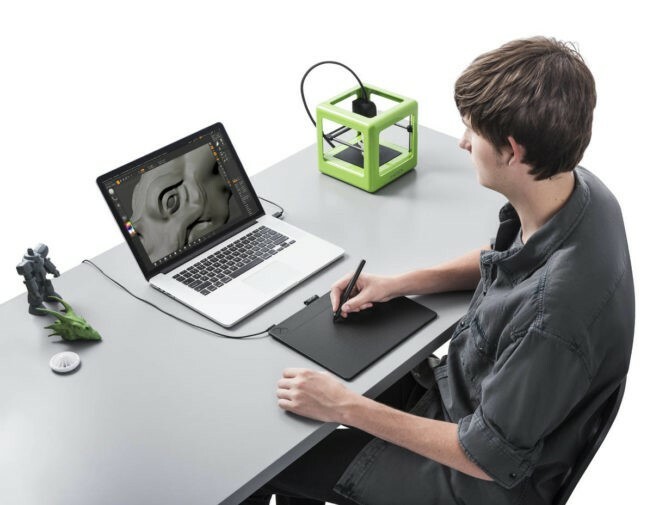 People who are into the whole collectibles scene in games and anime will really benefit from having the Intuos 3D graphics tablet and software. 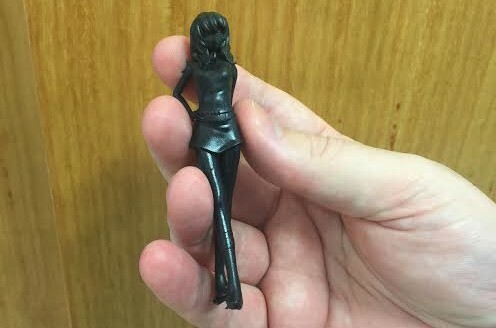 With perseverance and practice you will be making figure designs that are as good as the ones that you buy, and with 3D printers doing an increasingly good job of printing off detail and at a decent size, getting into this side of fandom will be yet another way to celebrate and participate in your hobby. I know a lot of people may have been put off trying something like this in the past, but you need not be; it’s not intimidating, it’s not challenging to use, and it’s priced at a point that allows anyone with interest in it to give it a go.